A father and son accused of threatening and abusive behaviour at a football match are to stand trial. 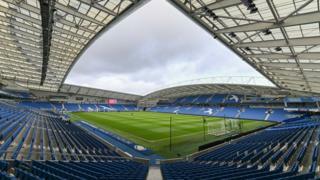 Burnley fans Stewart Higgins, 53, and Nathan Higgins, 18, were ejected from the Amex Stadium in Brighton, East Sussex, on 9 February. They denied making homophobic remarks during their club's 3-1 victory against Brighton and Hove Albion when they appeared before Brighton magistrates. They were granted unconditional bail ahead of a trial on 13 May. Stewart Higgins, an engineer, pleaded not guilty to using threatening or abusive words or behaviour likely to cause harassment, alarm or distress. His son, who is a student, pleaded not guilty to the same offence, and one of using racially aggravated threatening or abusive words or behaviour likely to cause harassment, alarm or distress. The pair, both of Talbot Drive in Burnley, were arrested after club stewards responded to reports of abuse.